Ok, so Greg came out to GA with his kit and we picked up at Turn 8. 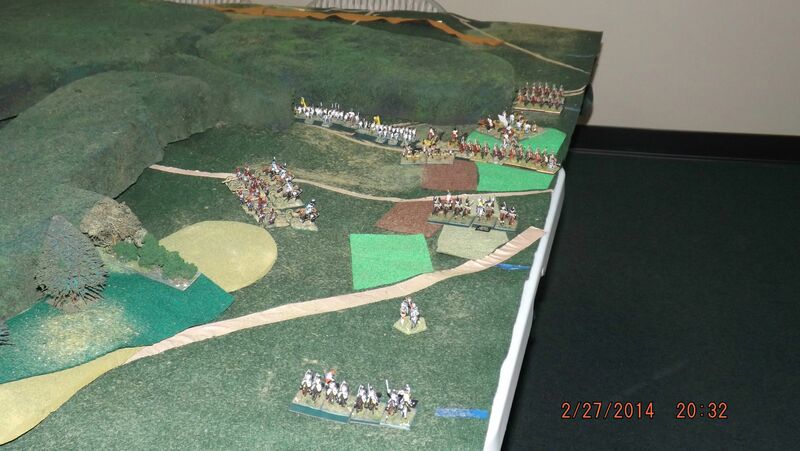 We made one reset, halving the French heavy cav casualties as we had played them incorrectly in Part 1. Still 25% down, but not permanently shaken. And Davout ran the Cuirassiers and foot arty that came in on the other side of the board from Friant/Bieber and was opposed by Vukassovich's Guard forces. The Hessian Hussars took both French heavy regiments to half strength with the help of their arty, while the heavies rendered one of the Hussar regiments permanently shaken, too. 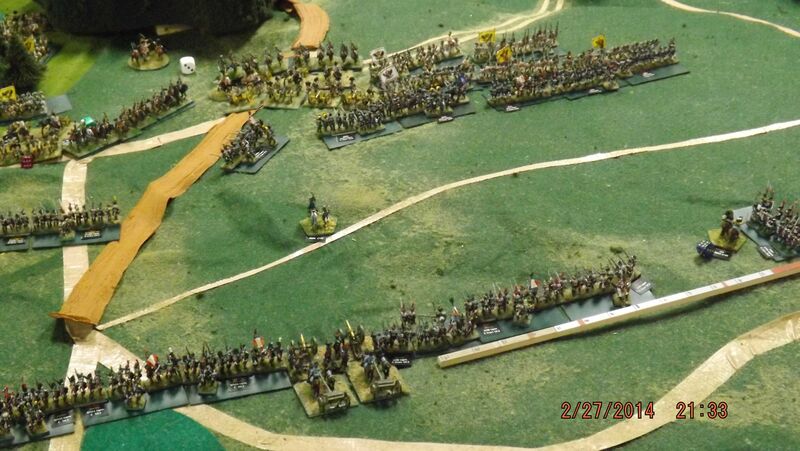 What the heavies did accomplish (with some fortuitous cards) was to allow the two foot batteries to run away. Greg's otherwise occupied with life thingies the next couple of weeks, so Part 3 will have to wait. 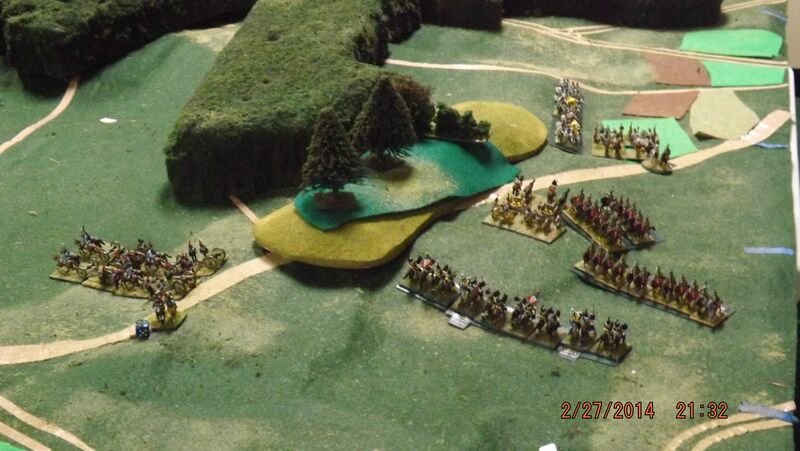 Any and everyone is invited to come out when we announce the next chapter in the saga and see if: you can help the French, missing the center of their line, to recover; or move large amounts of Austrian infantry and run the French off the table. I did find, after sitting down to write up the game, where I got a bit confused and thought the arty just ran when contacted. That happens only when there's no supports. 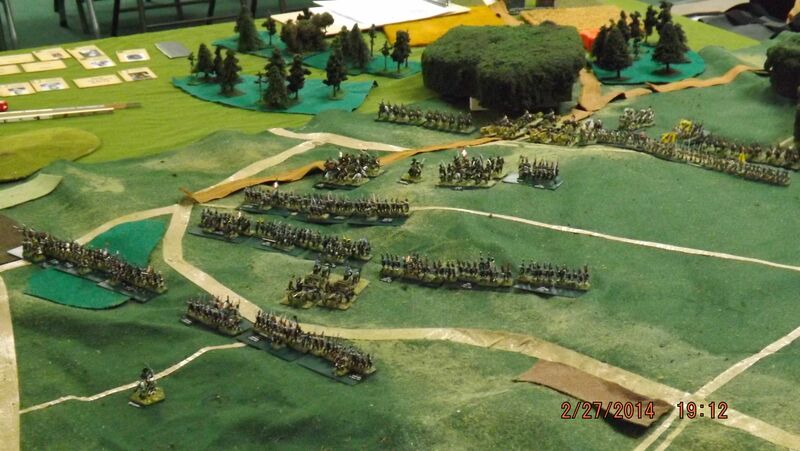 If the Ferdinand Hussars were not behind them, that would have been it for both batteries. Having the supports kept them in place and fighting. Yes I was wondering about that. I new from past (other wargames) that artillery that was not supported was doomed (unless they stop their foe with the canister). Since these rules are higher level and that gets rolled into the combat, it made more the reason to bring in the support so if "push came to shove", to evade from the guns. 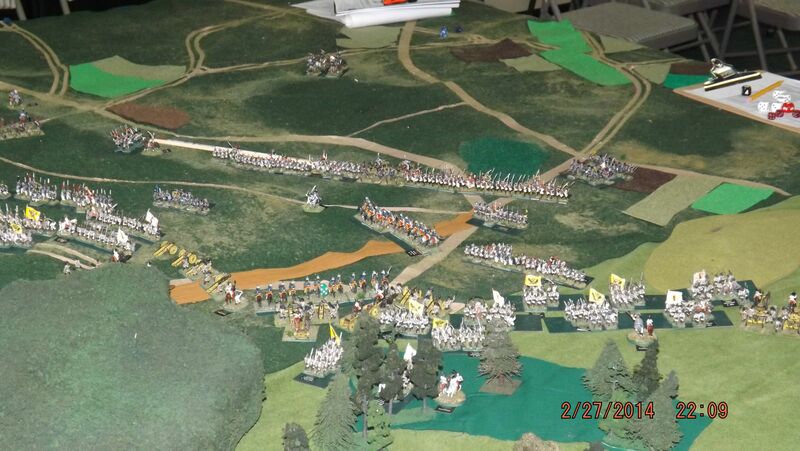 Thus from turn 8 until turn 12 v Bieber forces stood mostly motionless. Yes... that meant in this many turns... only 2 pips becoming available to act on with thanks to the “cautious/poor” card showing it’s ugly head prior to v Bieber’s card!!! UUUugh! Fortunately for the "white menace", Friant was ever so to be cautious in his approach (even with more than plenty of PIPs to work with)! His lack of pressure on v Bieber was to go on till turn 14. 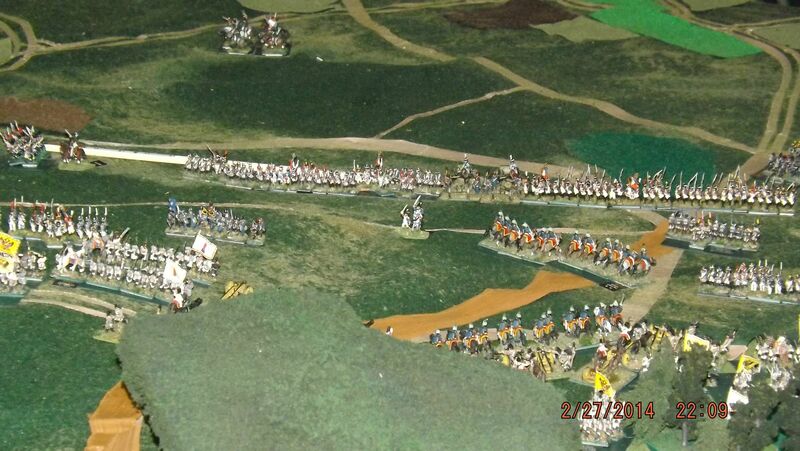 This allowed the "so very active and animated FML Rosenburg who had to go galloping down the road with this staff attempting to keep up…to order a turn around of both St Juliens and Lugansin’s command (and counter march back to near where they started) to become available to support v Bieber. The below picture shows their deployment of the two commands to v Bieber's right and effectively threaten the flank of the now and ever so late attacking GdDFriant. With Rosenburg’s arrival back with the long march column of white menace, v Bieber was to come alive (with the relief that came from the weight of the command that so paralyzed him removed….)! Yes ...FML Rosenburg was hit for the next two turns with the cautious/poor cards and v Bieber achieving 4 and 3 pips exclusively ( a roll of “5” and “4” on the average die none the less!!!). Things quickly had changed for the worst forGdD Friant! Now the stage has been set for the coming part III!